When the state of Lithuania was created Jews were granted a broad cultural and national autonomy, much broader than in other East European countries. At that time there were 154.000 Jews in Lithuania, i.e. 7.5% of the whole population. The declaration, signed by the Minister of Foreign Affairs Augustinas Voldemaras on August 5, 1919 says that members of Jewish nation with no discrimination in regard to their national, religious or cultural differences and equally with other citizens exercise all civil and national rights, among them the right to the unconstrained use of their languages in public events, press, theater, schools, courts and state establishments; Jews autonomously run their internal affairs concerning faith, charity, welfare, education, and spiritual culture in general. A complete autonomy in religious affairs was granted, with the right to celebrate Sabbath, other holidays. In 1930s the number of rabbis was 160. They registered births, weddings, divorces, and deaths, issued metrics. They also founded their Union. 185 communities elected their committees, which became local representatives of autonomy. 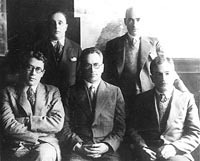 On January 5, 1920 the delegates of the committees set up the highest body of autonomy - 34 member National Council, which people called the Jewish parliament. The Lithuanian Government established the office of the Minister of Jewish Affairs. The Board of the Meeting of Lithuanian rabbis in 1930. Jews were also very active in running the country as a whole. The members of the Government, apart from the Minister of Jewish Affairs, were another two Vice ministers - Foreign Affairs and Trade & Industry. On equal rights with every one else Jews participated in the elections of parliaments and until the 1926 coup d'etat had their factions in all four Seimas. In the Constituent Seimas 6 delegates out of 112 were representatives of Jewish community, in the first Seimas - 3 out of 78, in the second - 7 out of 78, in the third - 3 out of 85. There were also quite a few Jews in local administrations, some of them were the Vice burgomasters of towns. In 1923, when the influence of Christian democrats gained strength, the autonomy of Jews was beginning to be limited. In 1924 the office of the Minister of Jewish Affairs, the National Council were abolished; the coup in 1926, which introduced the authoritarian regime, once and for all destroyed the democratic foundations of the autonomy. Nonetheless, in the field of religion it was maintained. Thus, for example, in the army next to the chaplain stood the chief rabbi who attended to Jewish soldiers. In general Jewish culture continued to be tolerated. There was a wealth of cultural, sport, educational clubs, theater troupes, which performed in Yiddish, a theater studio, around 120 public and the equal number of school libraries. Streets were named after famous Jewish personalities. In Kaunas there were streets of a writer Avraham Mapu, Liudvik Zamenhof, the creator of the Esperanto, Herman Minkovski, a genius mathematician, who introduced the geometrical interpretation of the theory of relativity, and others. Quite a few newspapers were published. In 1930s in Kaunas alone there were four dailies, two of them had separate evening editions. The Zionist daily "Yidishe Shtime" ("Jewish Voice") had the largest circulation. Zionist movement: the liberal Zionists, so-called general Zionists (they published the "Yidishe Shtime"); the leftist, socialist Zionists, in abbreviation CeEs, who co-operated with the Lithuanian Social democratic party; the nationalist Zionists, so-called revisionists, the followers of Vladimir Zhabotinski. Although the latter party was scanty, its youth organization "Betar" was one of the most numerous. There was also the party of religious Zionists "Mizrachi". 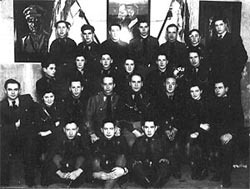 The non-Zionist religious party "Agudat Jisroel" was also active. 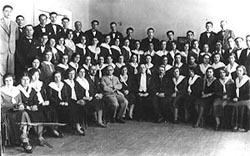 The Folkists (from Yiddish folk - nation) was a party of Yiddishists who strove for national autonomy in Lithuania, and not for the creation of the Jewish state in Israel, where all Jews should have settled. The Folkists published the influential newspaper "Folksblat". Jews were also members of non-Jewish parties, for example, Social democrats, as well as illegal Communist party.